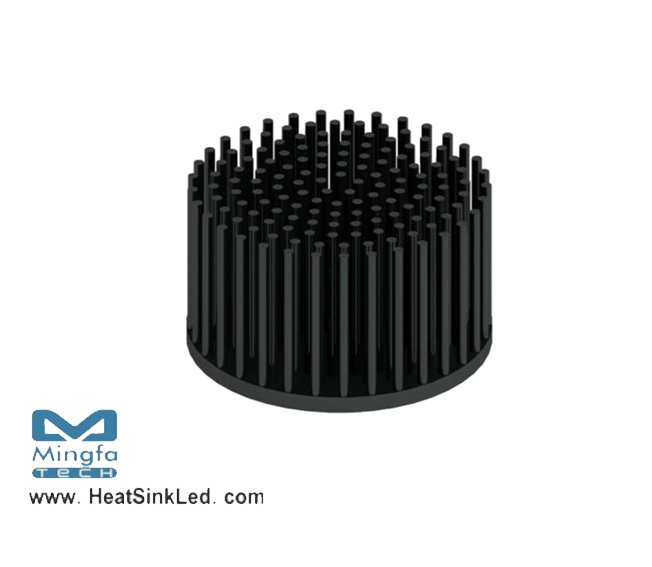 * The GooLED-GE-8665GE Lighting Pin Fin LED Heat Sinks are specifically designed for luminaires using the GE Lighting LED engines. * Mechanical compatibility with direct mounting of the LED engines to the LED cooler and thermal performance matching the lumen packages. * For spotlight and downlight designs from 2000 to 4800 lumen. * Thermal resistance range Rth 1.3°C/W. * Modular design with mounting holes foreseen for direct mounting of GE lighting InfusionTM LED engines. * Diameter 86.5mm - standard height 65mm Other heights on request. * Forged from highly conductive aluminum. © 2018 Mingfa Tech Manufacturing Ltd. All Rights Reserved.